We wish all our runners in Yangon a safe and fast race for this weekend’s marathon. 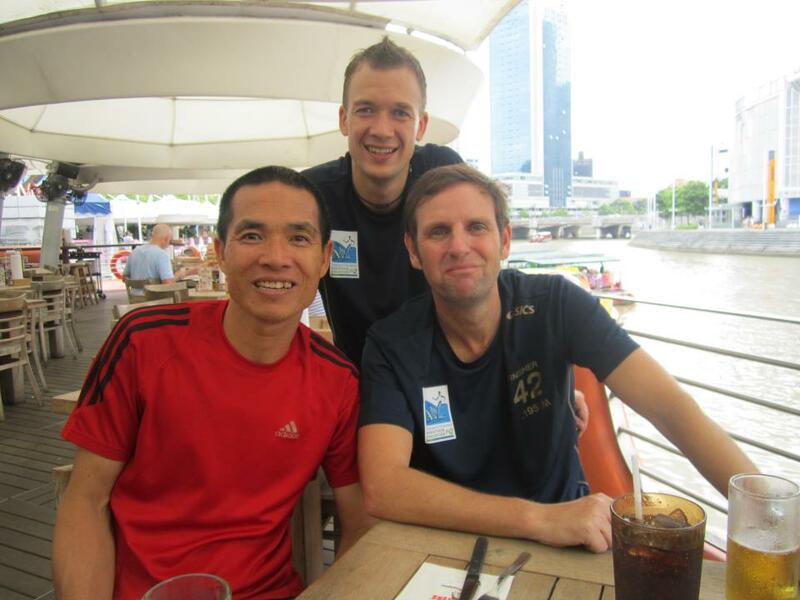 Just for fun – here’s a pic of 3 of our Yangon runners (Phi, Florian & Richard) after their last marathon in Singapore. Best of luck them and to Peter, Sune, Sara and Cuong and anyone else taking part. Today (Saturday), we’ll meet 3.55pm at JAFA for our social run. Speed training continues every Wednesday night at 7pm – always meeting outside Sedona, 96 To Ngoc Van street. Next Tuesday evening we recommend dropping by The Hanoi Bicycle Collective (No 46, Lane 31 Xuan Dieu) for a presentation about the Madagui Trophy adventure race which takes place March 9th & 10th. The presentation is at 8pm. Even if you’re not interested in joining this race, it’s a great opportunity to find out more about Pablo and his goals to organising teams for all the top events around the region. These are exciting times to be a runner / cylcist / swimmer in Hanoi. See you there!